If you need the sure-footed traction of all-wheel drive but shudder at the thought of driving a big, fuel-inefficient SUV, the 2009 Subaru Outback is the answer. All-wheel-drive confidence and new safety features add up to a prudent and pleasurable road experience, heightened by a comfortable highway ride. Comfortable, climbs like a mountain goat! I like that it sits high enough that I have better vision of surroundings, yet not so high that it would be difficult to get in and out of without a ladder ☺, like most other SUVs! Love the cargo area. This model has the gizmo to secure the drivers side floor mat right where I want to put my left foot while I drive. My leg is too short for it reach the area under the dash. Also when it rains,( a lot in NW ), the back seats get wet when you open doors because of roof line. I have upholstery not leather seats, so not good. Also wish MPG was better around town. Wish you would offer electric hybrid for this model. Best of all is All Wheel Drive as we have extremely steep driveway! My car is so comfortable, and so easy to drive that I love it! My vehicle has very comfortable seats that you can drive in for hours, and it never feels that long. The radio and CD player sound awesome through our speakers, and I like that I can turn the volume up very loud. I haven't had one problem that has had to be fixed in an entire year! As long as you keep up with the oil / fluid changes, and tune-ups, the car will last forever! It sounds great when idling, and is a very smooth ride. I like how cute it is- I love station wagon type cars, but not SUVs because they use too much gas. Our car gets so many miles to the gallon that it is amazing, and we rarely have to go to the gas station. It speeds up quickly, and I really like driving it! My car will always be a Subaru. My 2007 outback has been a great car for the past ten years. The all wheel drive is perfect for mountain passes and icy, snowy roads conditions. The large back hatch is great for gear, road trips and camping with our dogs. In the past ten years, I have had very little go wrong with the vehicle. I did have leaky gaskets which were a problem in 2007 to 2014 outback models. Having the gasket repaired along with a few other common maintenance items like spark plugs, battery and belts, are virtually the only repairs I have had. I would recommend a Subaru outback to most people and plan on my next car being another outback. 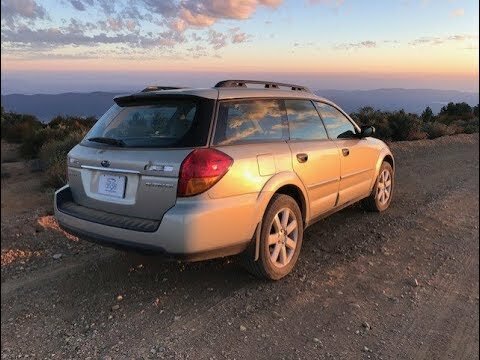 Subaru Outback: Is it a Good AWD Car to Buy? Subaru of America, Inc. (Subaru) is recalling certain 2009-2010 Tribeca, Impreza, Forester, WRX, Legacy, and Outback vehicles sold, or ever registered, in the states of Arizona, Arkansas, Delaware, District of Columbia, Illinois, Indiana, Kansas, Kentucky, Maryland, Missouri, Nebraska, Nevada, New Jersey, New Mexico, North Carolina, Ohio, Oklahoma, Pennsylvania, Tennessee, Virginia, and West Virginia. These vehicles are equipped with certain air bag inflators assembled as part of the passenger frontal air bag modules used as original equipment or replacement equipment. In the event of a crash necessitating deployment of the passenger frontal air bag, these inflators may explode due to propellant degradation occurring after long-term exposure to absolute humidity and temperature cycling. Subaru will notify owners, and dealers will replace the front passenger air bag inflator, free of charge. The recall is expected to begin February 9, 2018. Owners may contact Subaru customer service at 1-800-782-2783. Subaru's number for this recall is TKB-18. Subaru of America, Inc. (Subaru) is recalling certain 2009 Tribeca, Impreza, Forester, WRX, Legacy, and Outback vehicles sold, or ever registered, in the states of Alaska, Colorado, Connecticut, Idaho, Iowa, Maine, Massachusetts, Michigan, Minnesota, Montana, New Hampshire, New York, North Dakota, Oregon, Rhode Island, South Dakota, Utah, Vermont, Washington, Wisconsin, and Wyoming. These vehicles are equipped with certain air bag inflators assembled as part of the passenger frontal air bag modules used as original equipment or replacement equipment. In the event of a crash necessitating deployment of the passenger frontal air bag, these inflators may explode due to propellant degradation occurring after long-term exposure to absolute humidity and temperature cycling. Subaru will notify owners, and dealers will replace the front passenger air bag inflators, free of charge. The recall is expected to begin February 9, 2018. Owners may contact Subaru customer service at 1-800-782-2783. Subaru's number for this recall is TKC-18. Subaru will notify owners, and dealers will replace the passenger front air bag inflator, free of charge. The manufacturer has not yet provided a notification schedule. Owners may contact Subaru customer service at 1-800-782-2783. Subaru's number for this recall is TKB-17.